and thought I´d share here as well ..
Painting watercolor in digital - you can use a bunch of different techniques, different brush settings - and - different approaches. The technique I used this time is kind of "dry-looking" textured watercolor style, that can be achieved with only ONE brush actually; the different look of the strokes is just different settings (lets call it "variants") of the same brush. In my experience, Painting watercolor in Photoshop is not that intuitive (and does not look that natural) as in Painter; in PS the technique is a bit more technical (for me; compared to Painter), kind of "constructing" the image rather than really "painting" it, I would say ... anyway - you can achieve pretty decent "watercolor look" in Photoshop too. 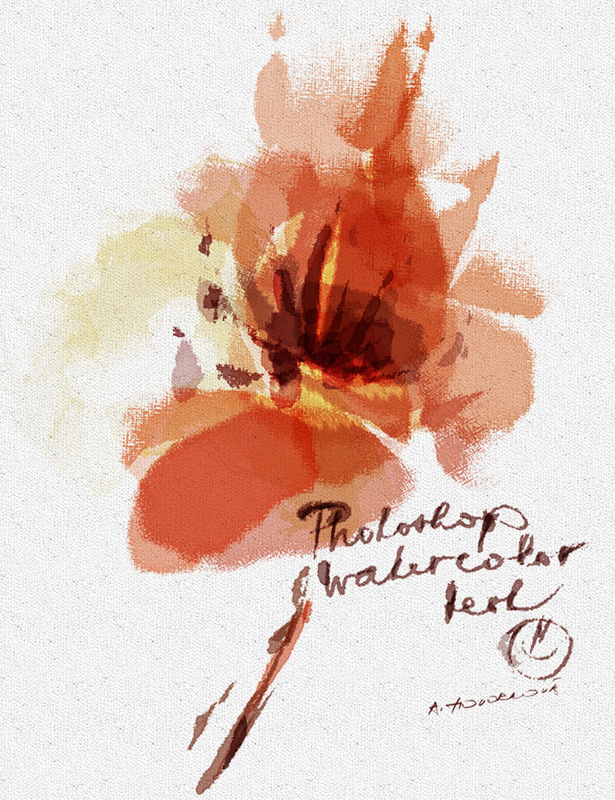 In fact, also in PS you can get a really "believable/convincing" watercolor painting, when combining the brushwork with some more other techniques (adding "real-salty" textures, exaggerating/sharpening edges, blending separate "washes", adding more random dabs/"splashes" to it etc.) - but - I wanted to keep the technique/illlustration as simple as possible, so - this time - I did not combine the brushwork with any other techniques mentioned. So - what is it that makes such a difference? The most characteristic feature of the real-life watercolor painting is the transparency. In real media the transparent washes are subsequently building-up the image, usually from light to dark. In PS this can be achieved by lowered opacity/flow combined with the Multiply blending mode (set for a Brush in the upper Property bar, and - in case you work in more layers - set also for those layers in the Layers palette), that allows the strokes to build-up (multiply) the paint in the overlapping areas. In order the multiplying effect can be achieved (so as the "building-up" effect can be visible) it is necessary to paint with more single/separated strokes (that is: several times over the same area to allow the strokes to overlap) rather than painting the way "click and drag" across the whole area you want to paint ..
All the brushes I used have a certain degree/quality of "tilt sensititivity" applied to it (defined in the Shape Dynamics dialog within the Brushes pallete): the basic 01 stroke is very slightly "tilt-sensitive", almost not responding to the tilt/position of the pen; the 02 texturizing and 03 stroke brushes are pretty sentitive to the tilt/way how you hold the pen while painting to allow the strokes to overlap) rather than painting the way "click and drag" across the whole area you want to paint ..
For this type of strokes Photoshop needs more time to calculate it, so you might experience some delay while painting larger areas. 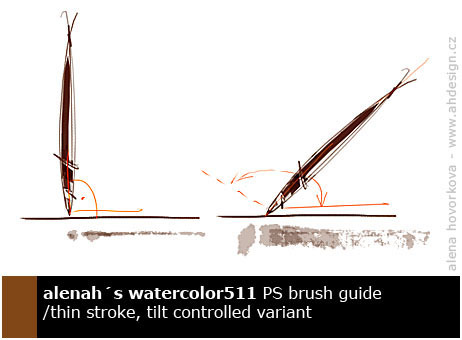 It is also a good idea to apply the strokes repeatedly, with different tilt/pressure over the same area; so as you can achieve nice and pretty natural texturing (when the tilt is a wide/large angle, the painted stroke/texture is almost not visible, which might be sometimes very useful for subtle texture painting). 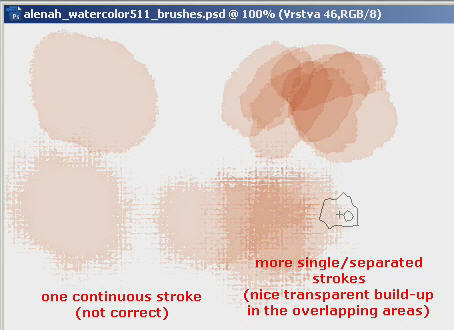 There is a few more/other little things, that may affect the look of the strokes (sequencing/repetition of strokes, layers order, using "white strokes" combined with Overlay blending mode for "washing out" the color etc.) but - those are not that fundamental ..
Last edited by alenah; October 15th, 2009 at 02:35 AM. Thanks for the tutorial on loading .tpl's in CS4. It was a lifesaver (school project due tomorrow). Thanks! Wow these brushes are amazing! I love the way they mimic pooling, really feels like painting with brushes loaded with water. 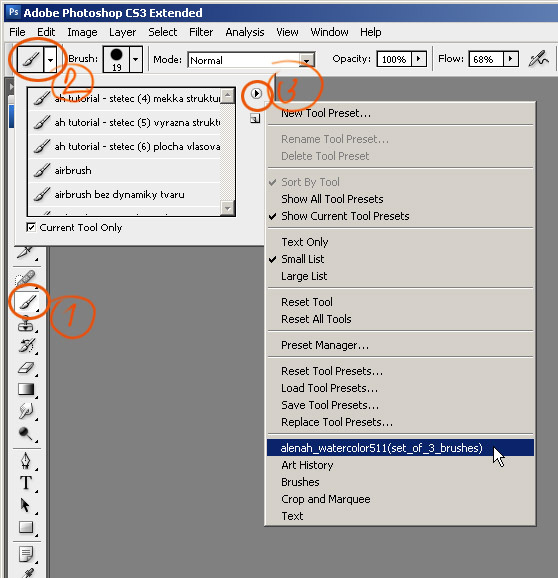 i have a mac and cs4 photoshop, i placed the tpl file in the tools folder, and still photoshop wont show the brushes help? Dude that is freakin' nice. Gonna try it out now. My page on Facebook, which I update much more often. Wow these brushes look so awesome. I cannot wait to try them out ^^. 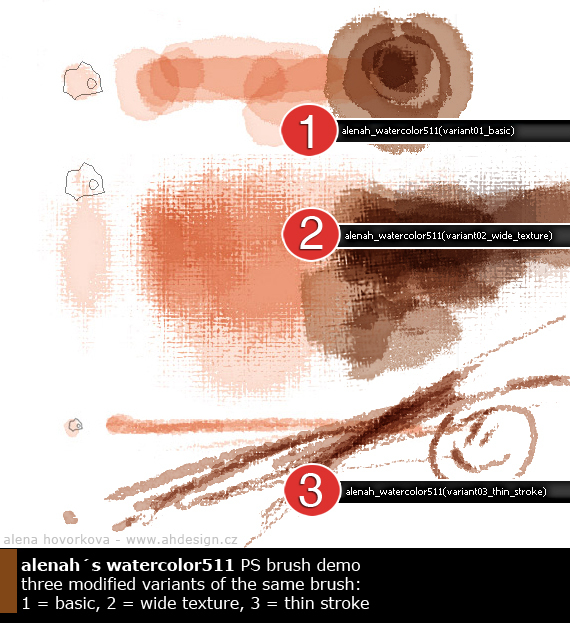 Textured Painter Brushes - Making them behave like Photoshop brushes?